Lets have a look at the damp chill of life, that cold a moist feeling of our world and all the lunatics that populates it. Like the guys who make up the band None, they have released albums in April 2017 and April 2018 and now they do so in 2019 as well – isn’t that kind of boring? Like clockwork is cool engineering but people being that dependable is rather useless, isn’t it? Perhaps that is why they are anonymous, and the same goes for the photographer of the cover, a pretty boring cover I think but I am not going to judge the book by its cover. 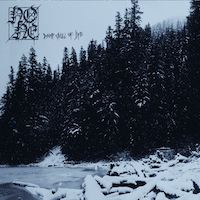 The title is quite reflective of what we are getting, black metal of the atmospheric kind – depressing atmospheres perhaps, it may be about the hardships of life or something similar to that. The songs are long, seven of them with a total playing time of about 45 minutes. The vocals are raspy and of that kind you hear in the atmospheric black metal or the sludge genre and I don’t think that they offer anything really fresh in terms of style and not that much variation either. It is a rather morose album I think. It has some strong atmospheres and some really interesting parts, but the album is quite drab overall. There is nothing that really stands out here, those who like the atmospheric black metal will probably find this one quite appealing. But I doubt that the album will have any kind of wider appeal, it feels like the target audience is a narrow field of people and I am not sure that I am one of those. I don’t really like this album, I think it has its moments but those are not many and it seems like they are not really aimed at me. In the end I will have none of this album, it just isn’t exciting enough to grab my full attention and I am not so sure that it will catch your attention either. There are some nice depressing atmospheres and they are quite good but overall I don’t think this album has what it takes and in the end it is rather forgettable. Perhaps that is the reason why they are anonymous, they don’t want anyone to know who actually created this bland and bleak album.